During a recent trip to southern California, I visited the Hollywood Forever Cemetery (formerly Hollywood Memorial Park Cemetery) in Los Angeles. This is a very fascinating place, as are all cemeteries for historical authors such as myself, because it’s amazing what you can learn about people by reading their headstones. Anyway, while touring the grounds, I discovered several Confederate graves. The cemetery is unique in that it was founded in 1899. 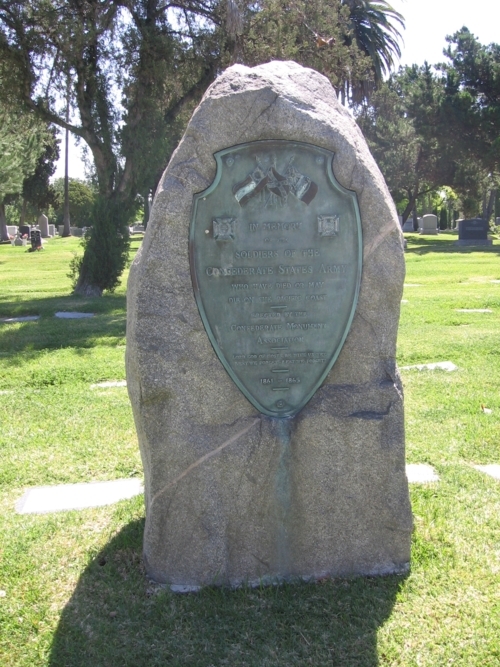 Many famous celebrities are buried there, including Charlie Chaplin, Rudolph Valentino, Bugsy Siegel, John Huston, Jane Mansfield, Johnny Ramon of the Ramones, Peter Lorre, and Mel Blanc, the famous voice of Bugs Bunny and other Warner Brothers characters. The cemetery backs to the Paramount Studios lot. Paramount purchased 40 acres with RKO by 1920. The cemetery nearly went bankrupt, but in 1998, all 62 acres were purchased for $375,000, refurbished, and renamed “Hollywood Forever.” Besides celebrities, an entire section is dedicated to Jewish people, as well as to the aforementioned Confederate veterans. This section is impressively quite large, proving that, after the War Between the States ended, many Civil War veterans migrated to California. This is a marvelous post! Thank you for this photo and information! This memorial has been removed due to public pressure.